Rajasthan Royals fought extremely hard but it was Sunrisers Hyderabad who were excelling today and won the game by 7 runs. Earlier, after winning the toss, Rajasthan's skipper Shane Watson chose to bowl first and put his compatriot David Warner's eleven to bat. The in-form opener for Hyderabad, David Warner and his partner whose form has been in-and-out so far in this tournament stepped in with high hopes and perfect moustache. 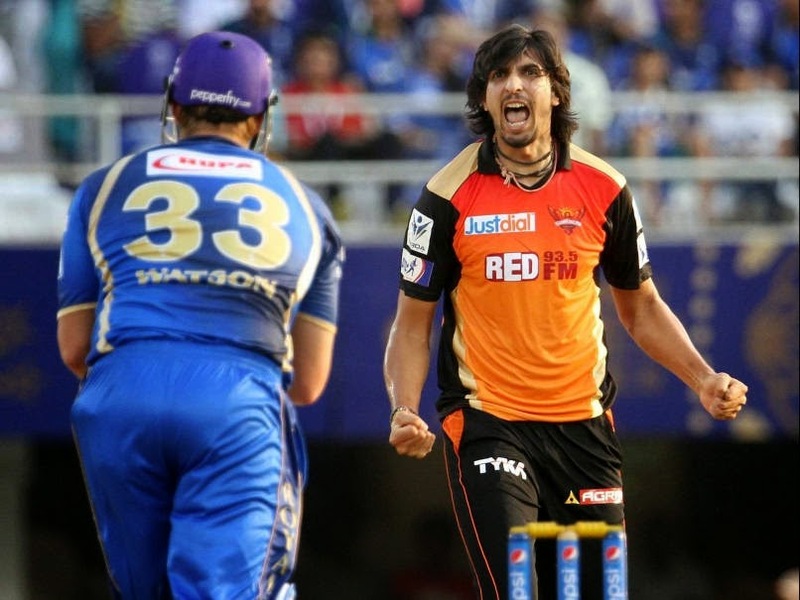 An off-spinner, Deepak Hooda was introduced in the very first over of the game. Shane Watson tried the combination of spin and pace with Deepak Hooda, Chris Morris and Dhawal Kulkarni in the initial four overs and he himself came into the attack to deliver the fifth one. Warner hitting hard on the first delivery, sends off the ball out to the fence and with that boundary comes up 400 runs for him in this season of the Indian Premier League. He is still on the second position in the hot pursuit of chasing the Orange-cap. After hitting another boundary in the same over Warner was caught behind by the keeper Sanju Samson off Watson. After a Warner-show of 18-ball-24, Moises Henriques, the only Portuguese in International Cricket came to the crease at number three. A set-partnership between Shikhar Dhawan and Henriques lasted for about five overs and score moved from 1-48 to 89-1, but Henriques was dismissed by 43-year-old Pravin Tambe in the eleventh over. Next, it was England's middle-order mainstay Eoin Morgan on the crease to bat. After Morgan's arrival, the momentum at which the runs were coming in. increased drastically. In the fourteenth over, Dhawan hits a fearless six and added another half century in his kitty. But the celebration for him didn't last for long as he was soon dismissed by James Faulkner. There were two England's batsmen on the crease after Dhawan left to rest with the blokes sitting in the dug-out as Ravi Bopara was the next man to come onto the crease. Morgan continued his smashing drill by hitting some big shots and left the bowlers of Rajasthan Royals unanswered. But even his innings came to an end when he tried hitting a straight six and the ball fell short of the boundary and went straight into the hands of Steve Smith in Watson's over. Eoin Morgan's incredible knock of 63 off just 28 balls helped his team to put a great score of 201/6 on the score board for the opponent to chase. With great total comes a heavy load of pressure on the batsmen and Rajasthan Royals needed to score at the run rate of 10.05 runs per over to win. The introduction of pace in the form of Bhvaneshwar Kumar paid rich dividends when Ajinkya Rahane needlessly tried a shot off the last ball and got a leading edge to be taken by the keeper Naman Ojha after hitting two boundaries in that very over. Just when a partnership started to build between the Aussie-duo, skipper Shane Watson and Steve Smith, Watson made a wrong choice of shot and he was easily caught by Praveen Kumar off Ishant Sharma. Karun Nair to bat at number four with a great total to chase, felt the pressure from the first ball he faced and failed to manage to stay on the crease for long, caught behind by the keeper and he walked out. After the openers' failure of performance, the middle order started to collapse. As a partnership was failing to build between the batsmen for long. The Rajasthan Royals' supporters lost hope , but in the 18th over Sanju Samson with back-to-back two big hits showed a ray of hope that could have ended up shinning brighter than that of the Sunrisers' bundle of rays. But even he failed and was dismissed by Bhuvaneshwar Kumar's pace attack on the next ball. Again, a turning point in the game was encountered when Chris Morris came to change the facet of play after hitting three consecutive sixes in the nineteenth over. Only 18 runs needed off the last over. Every Rajasthan supporter wanted Morris to repeat what he did in the previous over but it was the pace of Bhuvaneshwar Kumar that dominated at the end and Sunrisers Hyderabad won a crucial game by 7 runs. A close nail-biting match ended up in Sunrisers' favor and the Sun was still rising for the Hyderabad, a much needed win for them to stay alive in the tournament. A power-house performance, great beginning and good partnerships with superb bowling attack by the Sunrisers Hyderabad helped them to move upward in the points table at number to fix a spot at number 5. Eion Morgan was named as the player of the match for his quicker 28-ball-63.